The Heath's Marian Trail is a modern day pilgrimage route in the heart of St Helens. The Trail links 9 school, church and community groups in Thatto Heath, St Helen's. 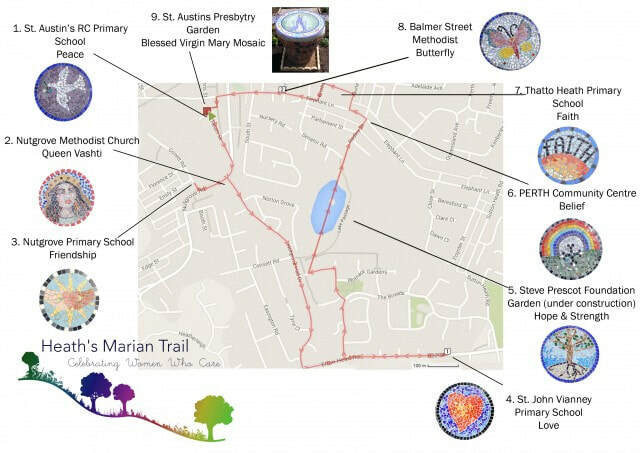 Creating a virtual and physical map, creating gardens and planted spaces, marked with community made mosaic tiles; the Heath's Marian Trail draws on the inspiration of Mary and plants associated with her to create a route that celebrates the women who care for us. The project was inspired by a parishioner from St Austin's RC Church and realised with a host of lovely folk including Parish Power, a sub group of the Justice and Peace Network of the Archdiocese of Liverpool; Nutgrove Methodist Primary School, Thatto Heath Primary School, St Austins RC Primary School and St John Vianney RC Primary School. The project was kindly funded by Westhill Endowment and LOCAL St Helens. "Our Marian Trail is based on Love. We are doing it based for Mary and our special ladies in our lives. We chose love because Mary showed love to everyone... My favourite part was when we did the blessing to Mary... We planted roses and we learned lots from Deacon Kevin and Mrs Griggs." - Zoe. "We will give the garden love by giving it water, giving it sun and nurture. We will go near it to think about all our special ladies in our lives like our Mums or Nans or Grannies." - Harry. "For the garden I chose Lady’s Mantle because it was a really nice flower. It made me think of my Mum. When I looked at it, it made me feel happy." - Karis. "My favourite part of doing the garden was choosing the plants to put in it because all the flowers mean different things. One of the flowers is about Mary’s eyes and her body. The flower I chose was forget-me-not. I chose this because it represents her eyes and that means that she is looking over us. We chose love as our theme because Mary loved us and we love her." - Ruby. "We have had an amazing time being part of this project and I, on behalf of school, would like to say Thank You! I ... cannot wait now until the whole project comes to life!" - Ms Phoneix, Year 4's teacher.